Wash canning jars, with bands and new lids, in hot, soapy water. Rinse well, and drain on a clean kitchen towel. Fill canning pot or large stockpot halfway with water, add in jars and bring to a near boil, then let simmer. Make syrup by combining sugar and water in a tall saucepan, bring to a boil, either use immediately or keep warm on medium-low. Drain jars using tongs, place on a clean kitchen towel. Ladle ½ cup hot syrup into the bars, using a sterilized canning funnel. 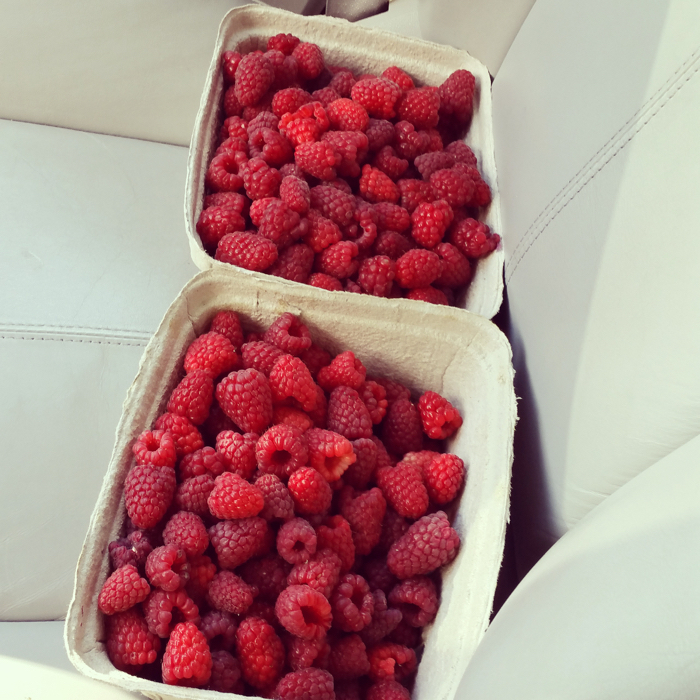 Pack in 1 cup berries, gently tap on counter. Add more berries. Pour hot syrup over the top, then run a sterilized chopstick (or a plastic air bubble remover) around the inside of the jar. Top off with more syrup if needed. Leave a ¼” headspace. Dip a clean paper towel in hot water, then run around the top of each jar. Place a lid on each jar, then a band, screw on finger tight. Turn canner up to high, place jars in water bath rack, lower rack into water. Water should cover by 1 – 2″, if not add a bit more (I have an insta tap on my sink, but used to keep a small pot of hot water on hand). Bring to a rolling boil, covered, process pint jars for 15 minutes. Turn off the heat, let sit 5 minutes, carefully remove jars, placing on a clean dry kitchen towel to cool. Once cooled, check again that seals are down (you should hear the Ping! as each one seals). Gently remove bands (wash, dry and store for your next project. While they look nicer on, if they have water inside from processing, they can rust. If you are giving away your canned items, you can always slip one back on), wipe down jars if sticky at all, note on jar or lid what is in jar with a date. Store in a dry/cool/dark area and use within a year. As always, if you ever go to use a canned item and the lid is not sealed anymore, or bulging, discard the contents immediately!!!!!! (I have only ever lost one jar in all my canning, so don’t fret!) 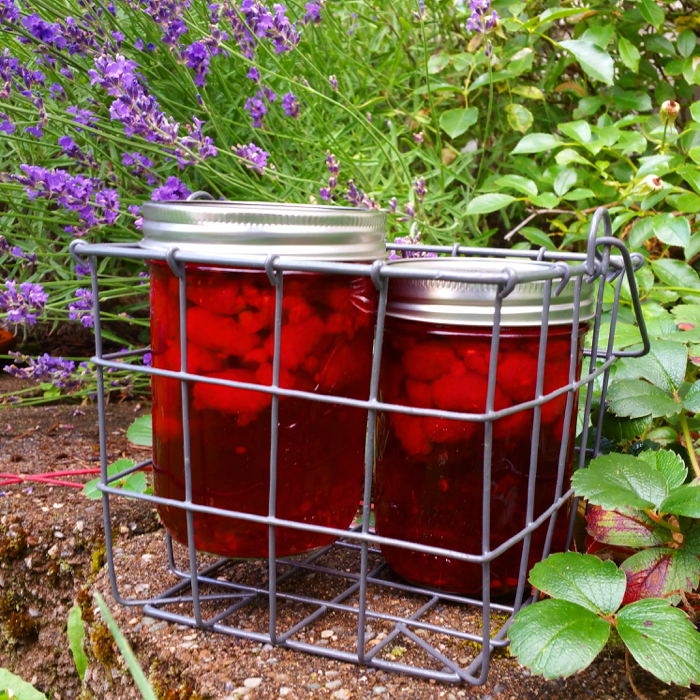 As long as you sterilize the jar before your next canning adventure, it is fine to reuse later. The syrup makes about 6½ cups, and is considered a “light syrup”. When canning fruit and berries, you will need ½ to ¾ cup per pint jar. Always hedge on the higher amount being needed, and keep an extra jar or two ready to be used “just in case”. That said, you can expect 6 pint jars total. If your berries are “dirty”, add in ½ cup apple cider vinegar to your rinse water, then drain the berries.